A Michigan man has joined the ranks of those with unusual tales behind their lotto jackpots. 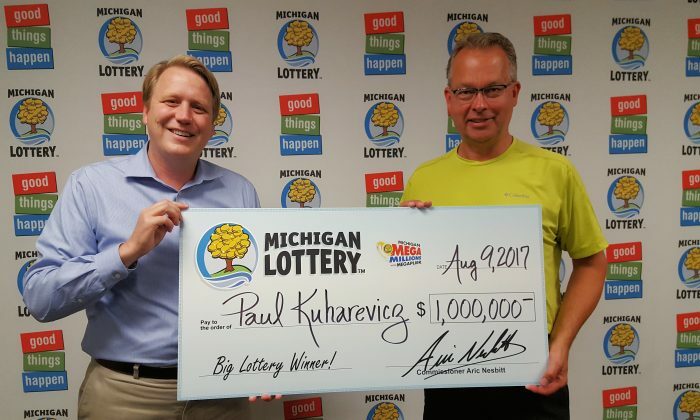 Paul Kuharevicz, 56, won $1 million thanks to a canceled flight that started a series of events leading to his fortunate purchase of a lucky lottery ticket. Kuharevicz was on his way home from a business trip in Chicago when his flight out of O’Hare International Airport was canceled. Kuharevicz decided to rent a car and drive the 200 miles home instead. When he got there, he realized he had left his bike at work so he went to pick it up. On the way there, he stopped and bought a ticket at Ladd’s convenience store. Kuharevicz learned the next day he had won the $1 million Aug. 3 draw after his son texted him saying that a winning ticket had been sold at Ladd’s. Kuharevicz told reporters he would invest some of his winnings and use the rest to buy a new bike, pay off his home, and fulfill a long-standing promise he made to his wife. Kuharevicz is not the first lotto winner with a fortuitous tale. Mary Wollens, 86, of Toronto won the Ontario Lottery in 2006. But her luck was doubled, though her winnings were not, after she decided to buy a second lotto ticket after seeing a large cheque and lotto ticket in a dream. The strange part is that she had already bought a ticket with those numbers. The dream prompted her to go out and buy a second ticket with the same numbers. Normally, that may not help much at all, but this time someone else had also won the same lottery. The extra ticket meant Wollens got two-thirds of $24 million jackpot instead of half. Dreams turn out to be a bit of a thing for lottery winners. One of many similar stories comes from Loughton, England, where Terry Vigus claims he dreamed the winning numbers. In a vivid dream he said the lottery balls dropped one by one. “I had matched five and was waiting for the sixth ball to fall when I suddenly woke up,” he told the BBC. His dream became true. Vigus won $1.94 million in 2014. A year earlier in 2013, two friends Carly Wiggett and Becky Witt, from Dartford, England, also had a prophetic win after Wiggett’s mother read their horoscopes in the daily newspaper and told them they were in for a huge windfall. The pair joked about winning but didn’t take it seriously. Luckly, they bought a ticket anway and won more than 336,000 pounds (US$435,724) on the Euromillions. But one of the craziest stories has to be that of Australian truck driver Bill Morgan who returned from the dead for an impossible win. Morgan was crushed in a car accident, developed a heart condition, and then suffered a heart attack from the drugs used to treat it. The heart attack killed Morgan for 14 minutes, after which he was revived. A year later, in 1999, he won a car worth $17,000 through a scratch-and-win lottery ticket. Morgan was being interviewed for a news story on his incredible win, and while the news crew filmed him re-enacting his win, he scratched a ticket and won AU$250,000. “I think I’ll have another heart attack,” he said.